Six months ago the Fed put up $29 billion to help keep Bear Stearns out of bankruptcy. On Sunday the government said no to similar help for buyers looking at Lehman. Here's why. 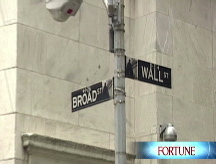 Running ragged on Wall St.
Has the Wall Street shakeup affected your confidence in the financial markets? NEW YORK (CNNMoney.com) -- When Lehman Brothers filed for bankruptcy on Monday, the government essentially sat on the sideline. Six months ago, when Bear Stearns faced a similar fate, the Federal Reserve intervened with the Treasury Department's support. Why did Fed Chairman Ben Bernanke and Treasury Secretary Henry Paulson change their tune? Experts say the Fed's lack of action on Lehman wasn't as much a change in thinking as it was a change in circumstance. They say simply that the firms were very different - that Bear posed a greater risk - and that regulators were better prepared this time to deal with the consequences of a failure. "The system wasn't ready for Bear to fail in March," said Jaret Seiberg, financial services analyst for policy research firm Stanford Group. "It couldn't have been unwound in an orderly fashion." In the case of Bear Stearns, the Fed engineered a bargain-basement sale of the firm by JPMorgan Chase (JPM, Fortune 500) by agreeing to assume $29 billion of the risk of losses from Bear Stearns going forward. But when other banks considering a purchase of Lehman (LEH, Fortune 500) over the weekend sought the same kind of assurances from the Fed, they were turned down. 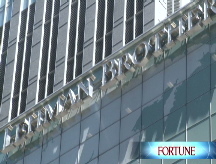 Without a buyer, Lehman had little choice but Monday's bankruptcy filing that is expected to lead to its liquidation. Seiberg said a Bear Stearns bankruptcy would have prompted a massive sell-off and hit the financial sector much harder than the Lehman bankruptcy did on Monday. The Dow Jones industrial average fell more than 500 points Monday - a very rough day but not as bad as many feared. Seiberg said that steps taken by the Fed to make more money available to Wall Street and banks since March means that "the market doesn't have the same liquidity fears about Lehman failing as it did about Bear." Barry Ritholtz, CEO of Fusion IQ, said that Bear Stearns' holdings also posed a greater risk to the nation's financial institution than did Lehman's. He said Bear Stearns had $9 trillion worth of financial instruments known as derivatives, much of it shared with other financial institutions such as its eventual buyer, JPMorgan Chase. He said Lehman had about a tenth that much exposure. "Lehman was only incompetent enough to blow up and destroy themselves, where as Bear's degree of incompetence was enough to threaten the entire financial system," Ritholtz said. There is also a sense that investors, financial regulators and Wall Street firms have a better handle on the problems in the financial markets than they did six months ago. The fact that Bear Stearns took place when there was so much more uncertainty is also a reason the Fed kept it out of bankruptcy then, but didn't step in to help Lehman now. "We didn't know what we didn't know in March," said Art Hogan, chief market analyst at Jefferies & Co. "We know much more now." And there is also the widespread belief that the Fed felt it needed to take a stand and not become the first and primary source of funds for every purchase of a troubled financial firm. "The Fed did not want to be in the position of having to save everybody," said David Wyss, chief economist with Standard & Poor's. But experts said it's certain that the recent upheaval - the Lehman bankruptcy and the seizure of mortgage lending giants Fannie Mae (FNM, Fortune 500) and Freddie Mac (FRE, Fortune 500) by the Treasury Department - will cause more losses going forward. "There's a possibility that this unwinds in a much more messy fashion than we're seeing right now," said Hogan. He wouldn't rule out the aftershocks of Lehman even causing a failure of another major firm. "It's too soon to say nothing bad has happened because of Lehman," he said. "I don't think we'll know in six days or six weeks. We'll know a lot more in six months than we know right now." And that uncertainty about the challenges that lie ahead is another reason that the Fed and the Treasury Department didn't want to rush in to keep Lehman out of bankruptcy - the realization that there could well be bigger and more expensive challenges ahead. "There was a lot of negative pressure about all these bailouts," said Bob Andres, chief investment strategist for PMC. "They have to use the money they have judiciously."